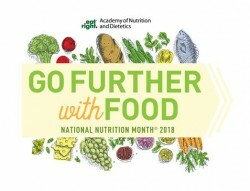 National Nutrition Month is an annual campaign that we celebrate to help raise awareness of the importance of our health and the control we have over it. Unhealthy eating and physical inactivity are the leading causes of death in the United States. 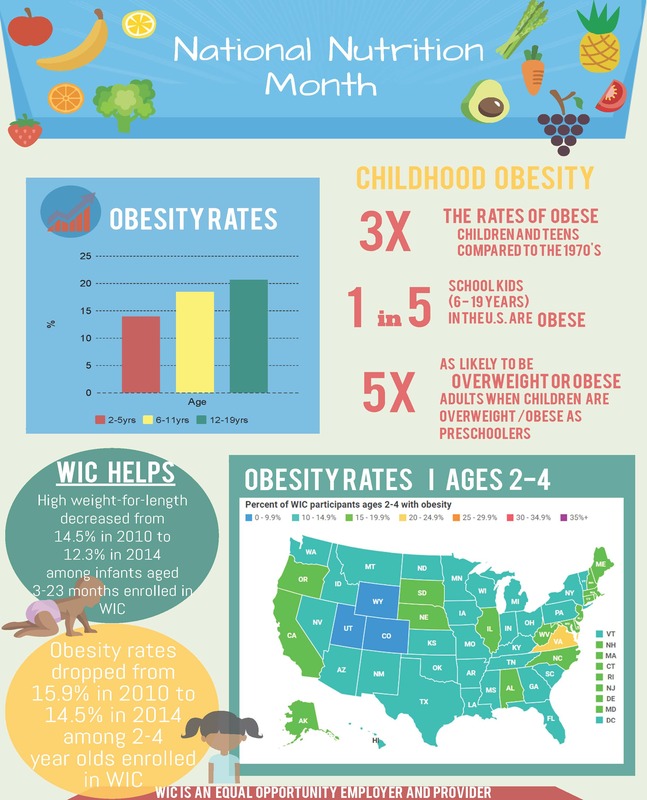 In the last thirty years, obesity rates have doubled in adults, tripled in children, and quadrupled in adolescents. Let us take this month to commit to making some healthy changes to our diet and lifestyle in an effort to reverse these statistics. Pick one change you would like to make this month and encourage friends and family to do the same. It may just help you and your loved ones live longer! We know you love your little bundle of joy. How could you not, look how cute they are! But with almost 50% of pregnancies in the U.S. being unplanned, we understand that many people may have wanted that bundle of joy a little later in life. Luckily, families have more control over child spacing than ever before. You cannot get pregnant while breastfeeding. It is not recommended to continue taking your prenatal vitamin while breastfeeding. Over 50% of ITCA WIC moms spaced out their pregnancies by at least 18 months. 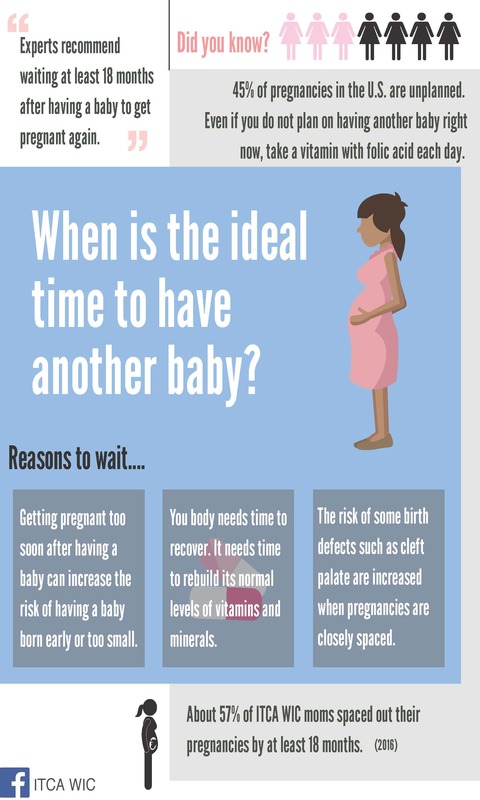 One reason to space out pregnancies is to reduce the risk for birth defects. 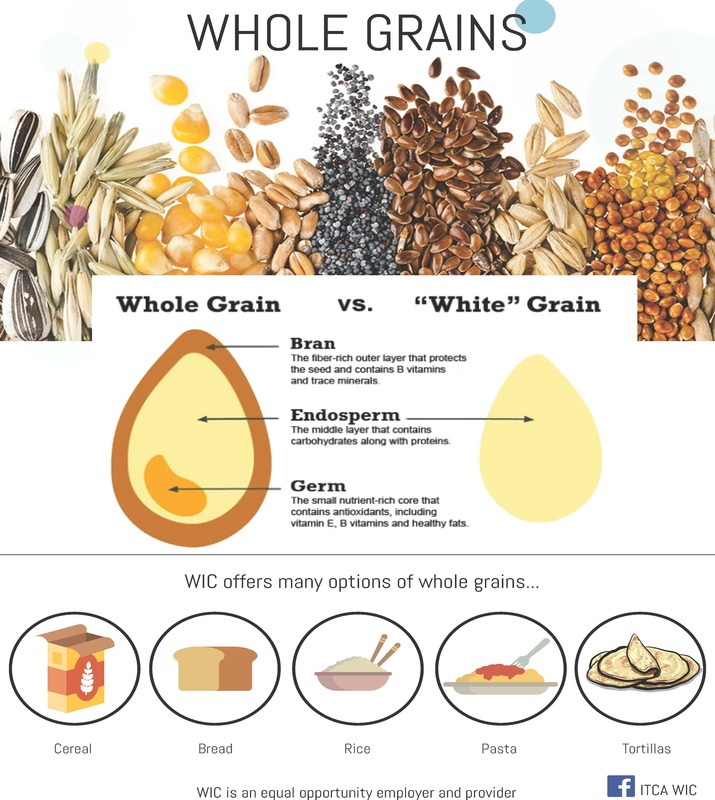 September is whole grains month and ITCA WIC encourages all of you to make at least half your grains whole! Consuming whole grains has many proven benefits such as reduced risks of cancer, heart disease, and type 2 diabetes. The consumption of them can lower cholesterol and blood pressure as well as improve digestion. Buy three diﬀerent loaves of whole-grain bread and taste all of them to see which one you like best. Serve bulgur or brown rice instead of potatoes with dinner one night this month. Look for the Whole Grain Stamp every time you shop. Try a new breakfast cereal with whole grains as the first ingredient. Buy some whole-wheat pasta and try it. Make my favorite whole grain recipe for a friend. On the weekend, try cooking a pot of steel-cut oatmeal. Make pizza for the kids with whole wheat pita as the crust. Serve hamburgers with whole wheat buns this week. Every year, ITCA WIC local agencies highlight the importance of promoting, protecting and supporting breastfeeding by celebrating World Breastfeeding Week and National Breastfeeding Month during the month of August. This year’s theme of Breastfeeding: Foundation of Life celebrates how breastfeeding prevents hunger and malnutrition and ensures food security for babies, especially in times of crises. Breastfeeding is a natural and low-cost way of feeding babies and children. It is affordable for everyone and does not burden household budgets compared to formula feeding. Breastfeeding can contribute to poverty reduction. Breastmilk is FREE. Not breastfeeding results in financial losses of about $302 billion each year. Families worldwide spend about $54 billion every year on formula. Exclusive breastfeeding and continued breastfeeding for two years and beyond provide high quality nutrients and adequate energy that can help prevent hunger, undernutrition and obesity. Breastfeeding means food security for infants. 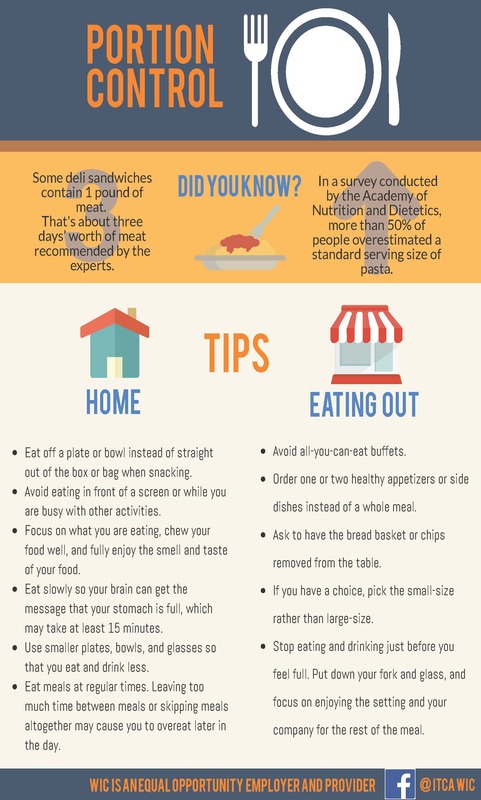 Tips on managing your portions at home and when eating out. 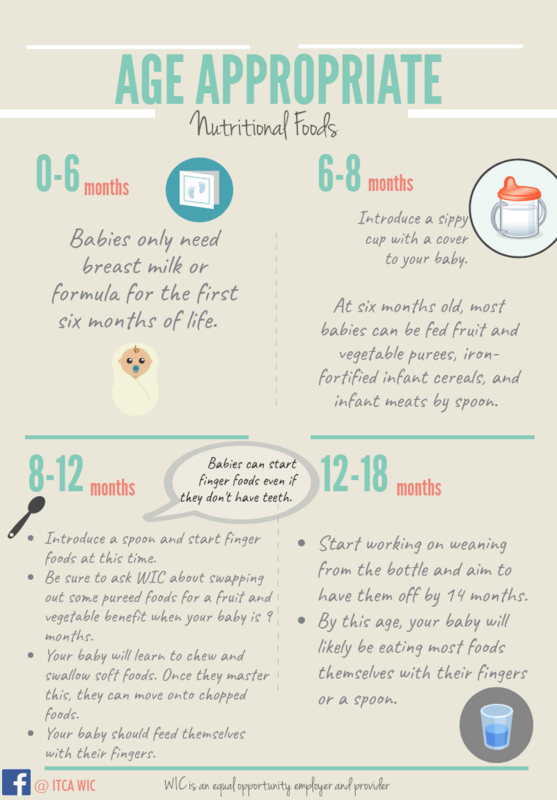 Tips on age appropriate foods for infants and children 18 months and younger. Create a meal prep plan that includes a variety of your favorite, healthful foods. Buy only the amount of food that your family can eat or freeze within a few days and plan ways to use leftovers later in the week. Be mindful of portion sizes – just eat and drink the amount that’s right for you. In order to find a personalized plan that works best for you and your family, consult a registered dietitian nutritionist. 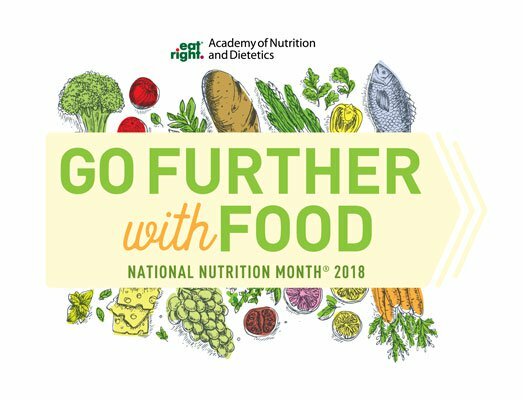 Learn how to go further with food and find a Registered Dietitian Nutritionist in your area by visiting eatright.org and following hashtag National Nutrition Month. You can also help raise awareness, particularly on February 2nd, which is National Wear Red Day. Why wear red? It’s because February 2nd is a day that has been dedicated to helping raise awareness of the high risk of stroke and other cardiac events in women. By wearing red, you are helping spread the word that 80 percent of cardiac and stroke events may be prevented with education and action. Take control of your own health and encourage other women to do the same by knowing their numbers: Total Cholesterol, HDL (good) Cholesterol, Blood Pressure, Blood Sugar and Body Mass Index (BMI). Knowing these numbers can help women and their healthcare provider determine their risk for developing cardiovascular diseases. Wear red, share your photos on social media, spread the word! Taking good care of your teeth is not just about having a nice smile and pleasant breath. A healthy mouth may help you ward off medical conditions. 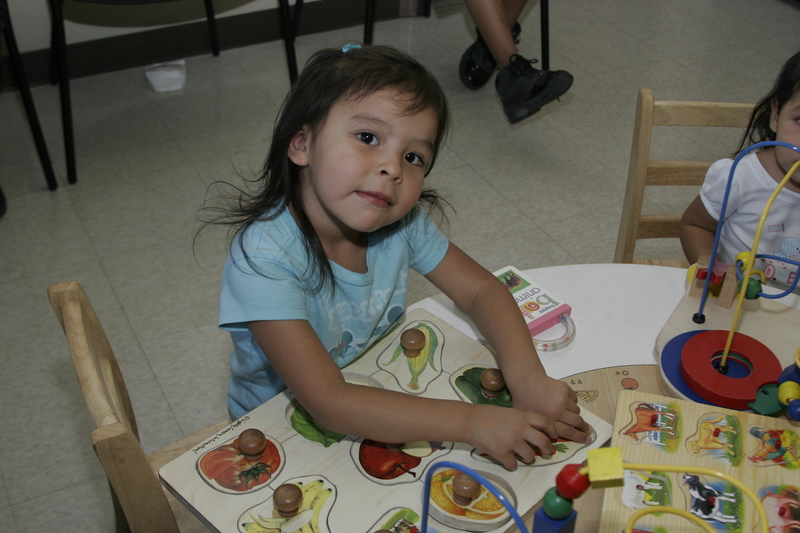 Tooth decay is a significant health problem for American Indians. 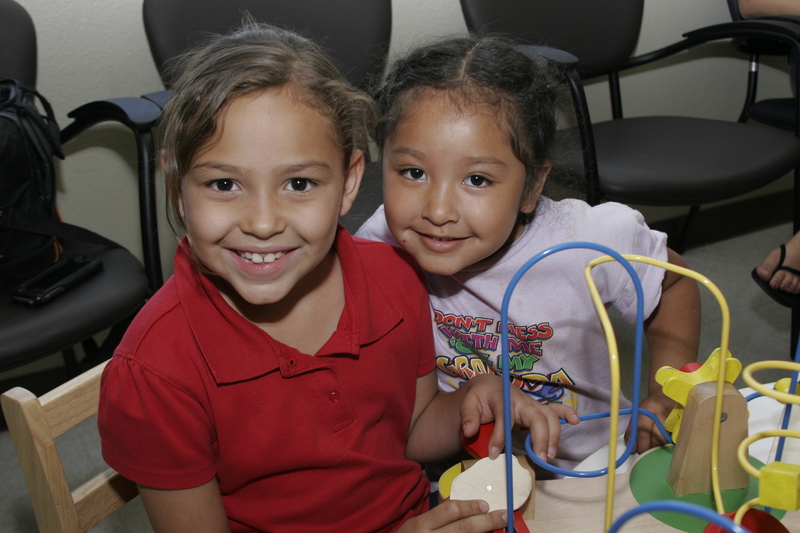 In 2014, more than 2.4 million American Indians lived in counties with dental care shortage areas, and half of all American Indian children lived in a shortage area. 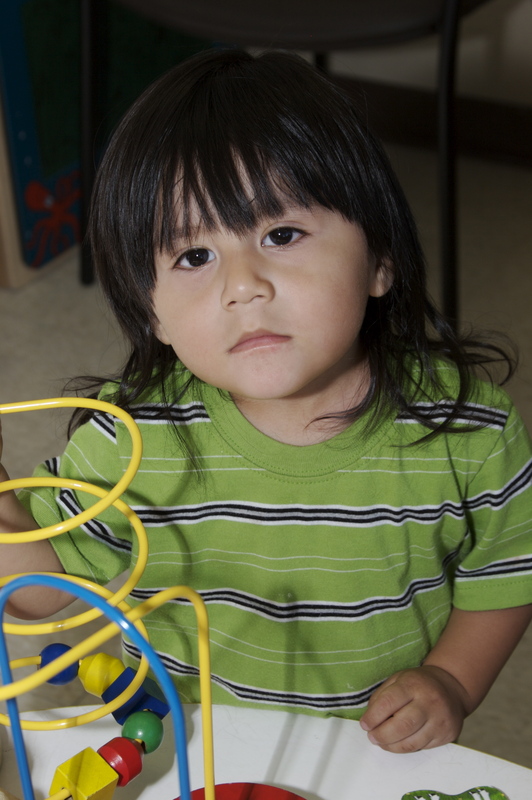 In fact, preschool-aged American Indian children had four times more cases of untreated tooth decay than white children—43 percent compared with 11 percent. Studies show that it appears the prevalence of dental disease among American Indians is increasing. Read on to learn more about how poor dental health can affect your overall health. Poorly Controlled Diabetes: If you have diabetes, you’re already at increased risk of developing gum disease. But chronic gum disease may, in fact, make diabetes more difficult to control. An infection may cause insulin resistance, which affects blood sugar control. Cardiovascular Disease: Oral inflammation due to bacteria called gingivitis may play a role in clogged arteries and blood clots. It appears that bacteria in the mouth may cause inflammation throughout the body, including the arteries. This inflammation may cause buildup of plaques in the arteries, possibly increasing your risk of a heart attack or stroke. Preterm Birth: Severe gum disease may increase the risk of preterm delivery and giving birth to a low birth weight baby. Research estimates that as many as 18 percent of preterm, low birth weight babies born in the U.S. each year may be attributed to oral infections. They suspect oral bacteria release toxins, which reach the placenta through the mother’s bloodstream and interfere with the growth and development of the fetus. Nutrition: Sensitivity in the mouth or pain while eating caused by dental problems can affect the foods we chose to eat. This can result in elimination of entire food groups which can greatly affect our health. Be sure to talk to your dentist about any pain or sensitivity in your mouth during your routine checkups. Start taking care of your oral health early on in life because you’re making an investment in your overall health, not just for now, but for the future, too. See the information below to find steps to care for your mouth in all stages of life. This month aims to bring your attention to eating more fruits and vegetables, whatever that may mean to you. You could add one more to your plate, try a fruit or veggie that is new to you, learn about fruits and vegetables, teach your kids, or try a new recipe. 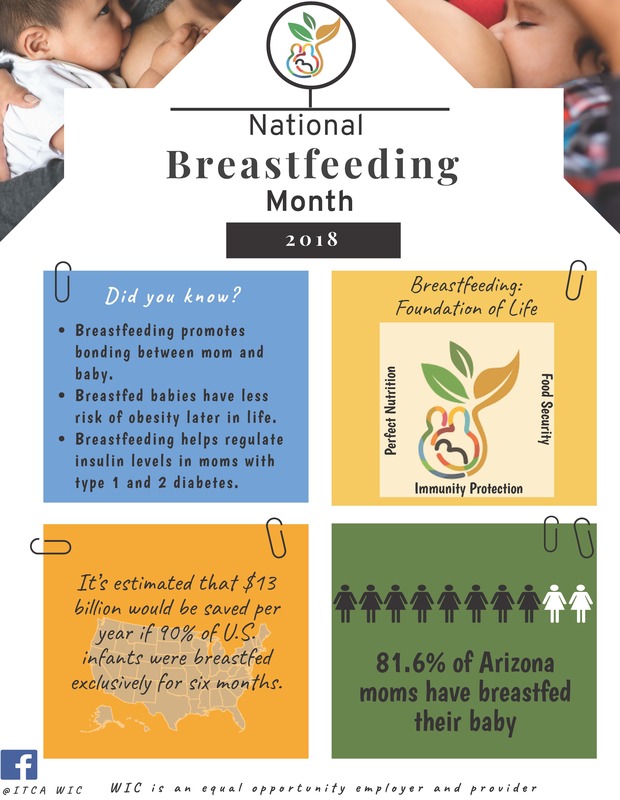 Every year, ITCA WIC local agencies highlight the importance of promoting, protecting and supporting breastfeeding by celebrating National Breastfeeding Month. This year’s theme of Sustaining Breastfeeding Together celebrates working together for the common good, so that mothers are supported and protected in their breastfeeding efforts. It continues to focus on sustainable development to better the planet for the generations to come. Breastfeeding can have a beneficial effect on many different aspects of sustainability that may not be apparent. Breastfeeding uses less energy compared to making formula. It reduces the need for water, firewood and gas in the home. Breastfeeding is earth friendly compared to formula feeding with zero packing, pollution and waste! Making formula involves dairy farming that stresses natural resources and adds to carbon emissions and climate change. 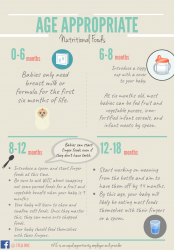 Breastfeeding creates less waste compared to formula feeding. Formula production and distribution lead to waste that pollutes the seas and affects marine life. Breastfeeding improves the health, development and survival of infants and children. It helps to improve health and wellbeing of mothers, both in the short and long term. Breastfeeding reduces a woman’s risk of breast and cervical cancer. In fact, 20,000 deaths due to breast cancer could be averted if mothers breastfed. Breastfeeding is essential for readiness to learn. Breastfeeding promotes brain development and helps with learning. Breastfeeding promotion in the community and workplace can help improve all these aspects, but it requires collaboration and effort. The more it is talked about, the more effective these messages will become. WIC works to promote a positive attitude towards breastfeeding. Let’s work to promote breastfeeding to help the lives of mothers, children, our planet and future generations to come. Summer is here and so is the heat! 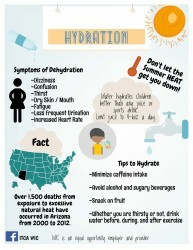 During these hot days be sure to stay hydrated by following some of these tips. 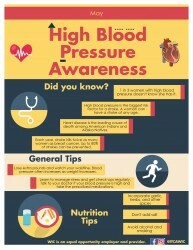 May is National High Blood Pressure Education Month and ITCA WIC would like to share some information with you. High blood pressure, also known as hypertension, increases the risk of certain diseases and stroke. Heart disease and stroke are the first and seventh major causes of death amongst American Indians and Alaska Natives respectively and yet many people with high blood pressure don’t even know they have it due to a lack of signs and symptoms. 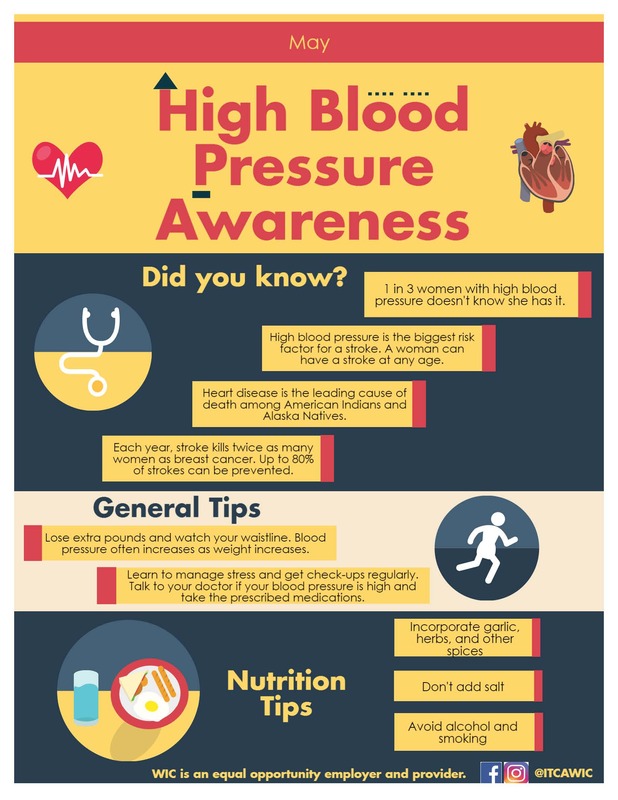 High Blood Pressure Education Month encourages people to get their blood pressure checked regularly and to look at various lifestyle factors which may be contributing to high blood pressure. Check out the following resources to find out what you can do to control your blood pressure. The Inter Tribal Council of Arizona is honoring American Diabetes Month. Diabetes rates are on the rise in the US. Today, 1 in 11 Americans has diabetes and every 23 seconds someone is diagnosed with diabetes. American Indians have a 2.2 times higher likelihood to have diabetes compared to non-Hispanic whites. There was a 68% increase in diabetes between 1994 and 2004 among American Indian youths aged 15-19. Data from the 2009 Indian Health Services’ (IHS) National Patient Information Reporting System (NPIRS) indicate that 14.2 percent of American Indians and Alaska Natives aged 20 years or older who received care from IHS had diagnosed diabetes. Statistics show that diabetes causes more deaths than AIDS and breast cancer combined. People with diabetes can experience serious complications, including heart disease and stroke, blindness, chronic kidney disease, nervous system damage, and amputations. But people with diabetes who work with their health care providers and take care of their health can take steps to control the disease and lower the risk of complications and premature death. There are a few types of diabetes; Type 1, Type 2, and Gestational. Type 1 is also referred to as juvenile diabetes because it typically appears in adolescence. With the help of insulin therapy and other treatments, even young children can learn to manage their condition and live long, healthy lives. Type 1 diabetes accounts for only 5 percent of people with diabetes. Type 2 diabetes accounts for 90 to 95 percent of all diagnosed cases. This form of diabetes is caused by a combination of things; genetics, extra weight, specifically extra fat around the waist, and more. Gestational diabetes only appears in pregnant women and develops in 2 to 10 percent of all pregnancies. It usually disappears when a pregnancy is over. However, if not treated, it can cause problems for mothers and babies. 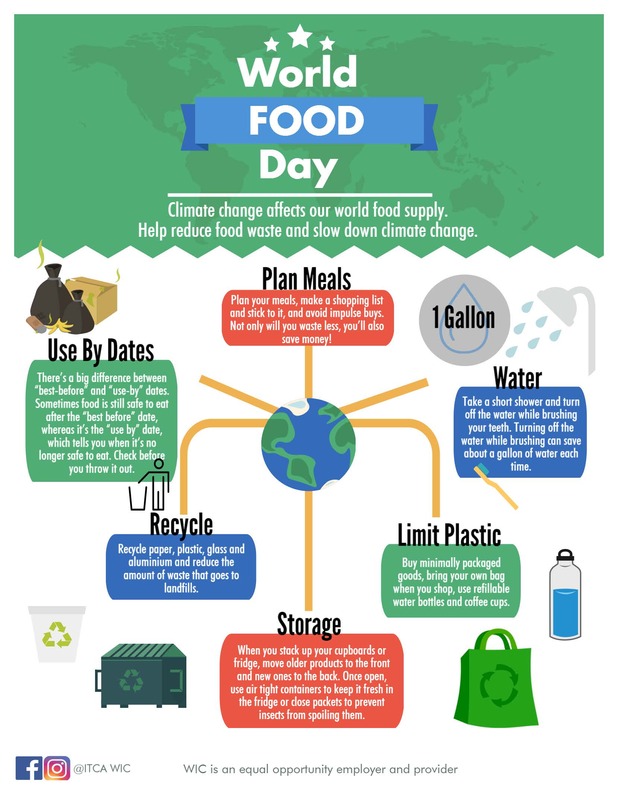 One of the biggest issues related to climate change is food supply and food security and with our population growing each day, this problem affects more and more people. Everyone has a role to play in lessening the effects of climate change. Countries need to invest in stallholder farmers and sustainably increase food production, but there are also a number of actions that you can take to help. 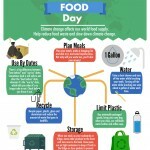 By being a conscientious or ethical consumer and changing simple day-to-day decisions, for example, by wasting less food, or eating less meat, we can reduce our environmental footprint and make a difference. Fruit Skewers – Frozen fruit chunks such as grapes, banana slices, blueberries, mango or watermelon on skewers – make a rainbow on a stick. Breakfast Boost – Add bananas or berries to your morning cereal or oatmeal. If you eat an omelet, add bell peppers and onions for some extra flavor and nutrition. Fill up on Veggies – Making soup, pizza, sandwiches, or lasagna? Try adding some vegetables such as spinach, tomatoes, bell peppers, carrots, mushrooms, etc. Be Sneaky – If you have a picky eater, try shredding or finely dicing some veggies into some of their favorite dishes. Feature a Fresh New Vegetable– have your child pick out a new vegetable each week and incorporate that vegetable into your meals or snacks. Children are much more likely to try something new when they pick it out themselves. Goodbye Cookie – Try offering fruits and veggies with a dip as a snack instead of cookies or crackers. Studies show the popularity of serving cookies as a children’s’ snack is on the decline. Fruit is now the number one snack item parents give to children under the age of six. Try sliced cucumbers, carrots, bell peppers, apples etc. Smoothies – Try using yogurt and your favorite mixture of fruits to blend together into a smoothie as a refreshing drink. Salad on the side – Try offering a small side salad at dinner time. Children can fill their plate with how ever much they want. 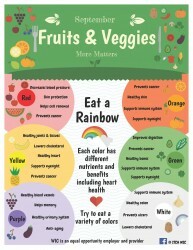 Reasons why to eat more fruits and vegetables? Fun to eat – some crunch, squirt, some you can peel, and some you can grow in your own backyard! Quick, convenient, and natural – fruits and vegetables are natures treat – they are very portable and easy to pack as a snack. Variety – They come in so many colors, shapes, and sizes. Vitamins and minerals – they pack a lot of nutrients to keep you feeling healthy and energized. 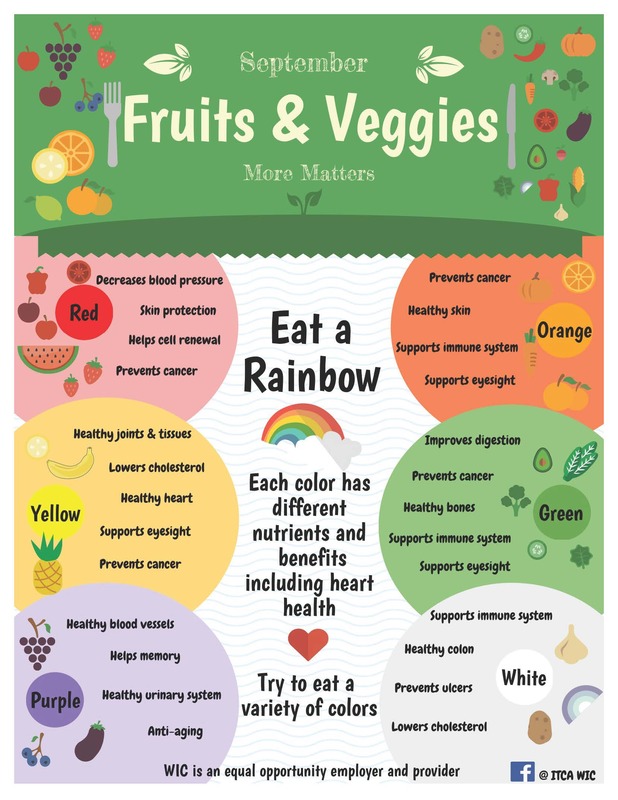 May reduce risk of diseases – eating a variety of fruits and vegetables may reduce a person’s risk of many diseased including heart disease, high blood pressure, and cancer. Fiber – fruits and veggies provide fiber that helps fill you up and keeps your digestive system happy. Beat the Heat! Stay Hydrated! Arizona is one of the hottest places on earth from May to September which makes heat related illness very common during these months. Over 1,500 deaths from exposure to excessive natural heat have occurred in Arizona from 2000 to 2012. Anyone can be affected by heat-related illness but children under 4 years of age are at an even greater risk. 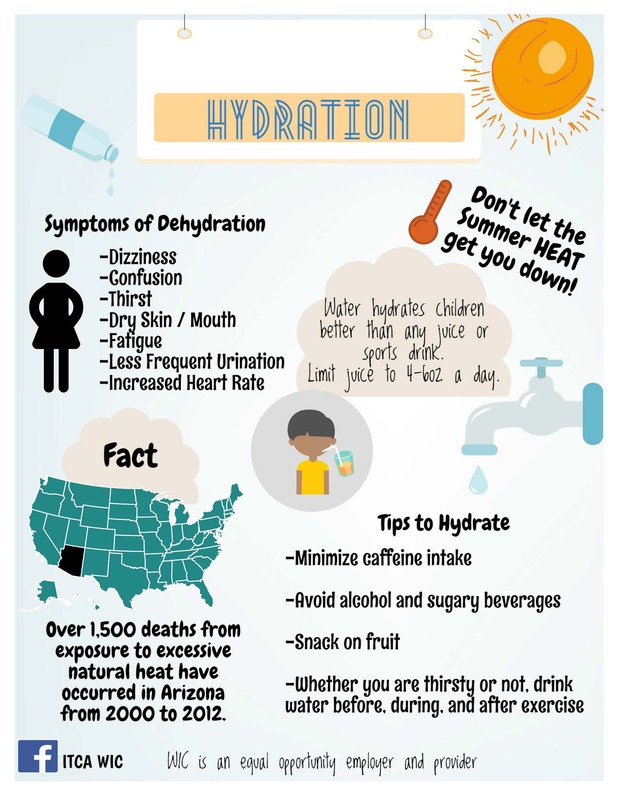 One of the best ways to prevent heat related illness is to stay hydrated. The amount of water someone needs is variable depending on age, heat exposure, activity and other factors. Everyone should drink enough water to quench their thirst, however in extreme heat; we may forget to drink enough water. Most people will need at least 8-10 cups of water under normal conditions. More water may be needed if it is hot and the person is active. Try to minimize alcohol and caffeine intake because these drink may dehydrate you more. Offer kids water instead of sugary beverages such as juice, soda, Gatorade, kool-aid, and sweet tea. Check out the following resources to stay cool this summer and stay hydrated. 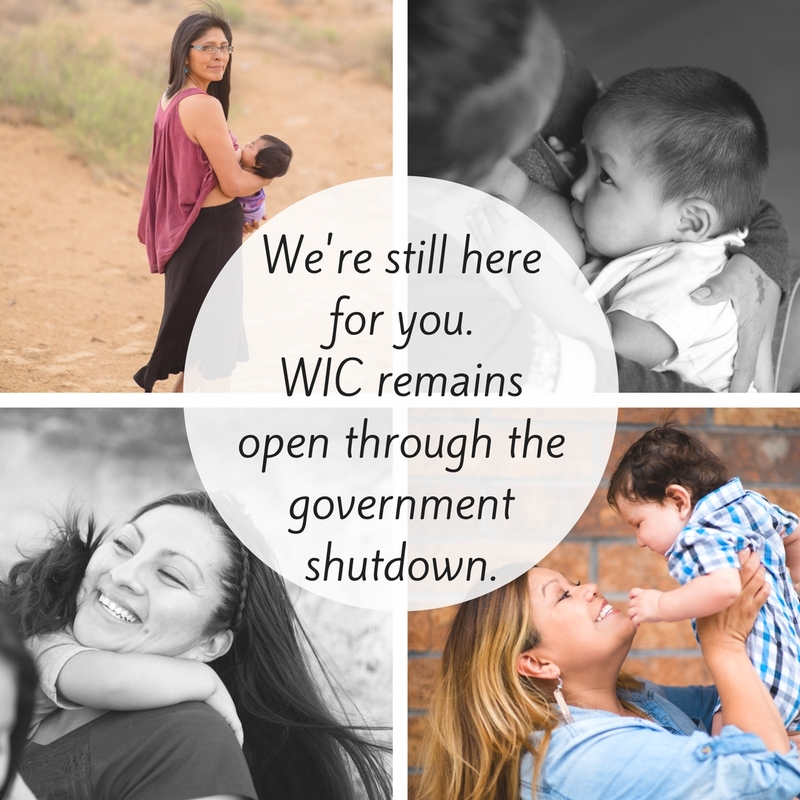 Native Americans for Community Action (NACA) began offering WIC services in Flagstaff on June 28, 2016! Call 928-773-1245 for an appointment or visit them at 1500 E. Cedar Ave, Suite 26 in Flagstaff. ITCA WIC is honoring June as Safety Month by sharing some important safety tips for women, infants, and children. Every child is at risk for choking, but children under the age of 4 years are more likely to choke because they have narrow throats and airways, cannot chew very well due to lack of teeth, and they often put things in their mouths. Pregnant women need to be careful about food safety. According to the CDC, 48 million persons get sick, 128,000 are hospitalized, and 3,000 die from illness caused by food in the United States each year. Pregnant women and their unborn children have a higher risk of developing certain foodborne illnesses because their ability to fight off infection is lower when pregnant. Use the links below for foods that should be avoided during pregnancy and safe cooking tips. Each year, thousands of young children are killed or injured in car crashes. In fact, the CDC reports motor vehicle crashes are a leading cause of death for American Indians aged 1–44. On average, 2 American Indians are killed every day in motor vehicle crashes. American Indians are injured or killed in motor vehicle crashes at much higher rates than other Americans and have lower use rates of car seats, booster seats, and seat belts. Proper use of car seats helps keep children safe. With so many different styles and seats available, it may be hard to tell which one is the right one. The type of seat your child needs depends on several things, including your child’s age and size and the type of vehicle you have. Read the links below for information on selecting the correct seat for your child and other car seat safety tips. You may be able to get a free car seat in your area. Ask your local fire or police departments about free car seats in your area. Cardiovascular Disease: Oral inflammation due to bacteria, also called gingivitis, may also play a role in clogged arteries and blood clots. It appears that bacteria in the mouth may cause inflammation throughout the body, including the arteries. This inflammation may cause buildup of plaques in the arteries, possibly increasing your risk of a heart attack or stroke. Whenever an important event or holiday comes around, what do we all gather together to do? EAT! Gathering around food to share and converse with friends and family is something that puts everyone in a good mood. Even something as simple as a nightly family dinner has been proven to be beneficial in terms of strengthening family relationships as well as healthy eating. Savor those moments. In today’s busy world, many of us eat on the run and don’t even sit down for a bite. 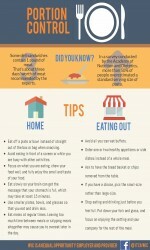 This has resulted in many of us eating quickly and mindlessly. Slow down. Savor each bite and actually experience your food. Eating slower has been linked to eating less because your stomach has time to tell your brain it is getting full. Sugar, fat, and salt are three of the things Americans tend to consume in excess. Cut back on the amount of sugar added to things you eat or drink regularly like coffee or iced tea. Buy low-calorie beverages or better yet, drink water! Try making it exciting by flavoring it with your favorite fruits or vegetables. Use canola or olive oil for cooking instead of butter or lard. Try baking, broiling, or grilling foods as opposed to frying. Replace whole-fat dairy with low-fat or nonfat milk, yogurt, and cheese. Replace meats with skinless chicken or fish a few days a week. Limit salty condiments such as ketchup and salad dressing. Try a yogurt-based dip instead. Instead of deli meats like bologna, salami, ham, and hot dogs, try baked chicken or turkey in sandwiches. Skip the salt and try salt-free seasonings such as herbs, spices, garlic, vinegar, black pepper or lemon juice. 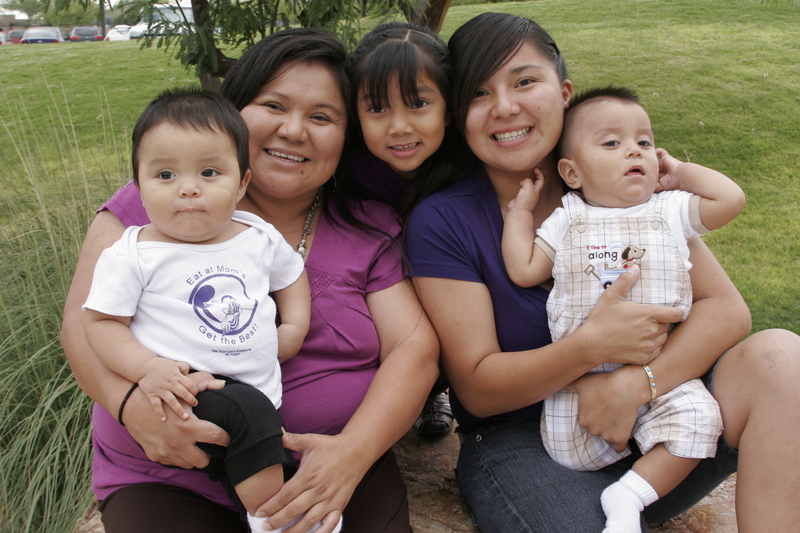 The Inter Tribal Council of Arizona WIC Program is increasing awareness of the prevalence of heart disease in the United States, particularly in American Indian women. Heart disease causes one in three deaths in women each year. That equates to one woman every minute. American Indians die from heart diseases at younger ages than other racial and ethnic groups in the United States. Thirty–six percent of those who die of heart disease die before age 65. February is National Heart Month so join us in taking a stand against America’s top killer, heart disease, because 80% of cardiac and stroke events may be prevented with education and action. The first step is becoming familiar with your family history. The information you provide will help your doctor be on the lookout for early signs of the same diseases in you and your children. Go to your doctor for regular physicals and screenings for blood pressure and cholesterol. This is especially important because heart disease may have no symptoms. We can also take measures every day to help keep our hearts healthy. Exercise Well: Manage your weight. 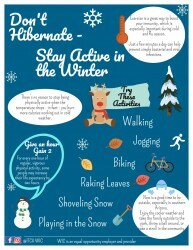 Choose activities that you will enjoy doing such as hiking, gardening, or traditional dancing. You can do anything physical that keeps your heart rate up for 30 minutes 5 days a week. If you don’t have time for a whole workout, try doing spouts of exercise for just 10 mins a few times throughout the day. Live Well: Try to adopt healthy habits that help manage stress such as smudging or exercise. Make sure you get enough sleep each night. When you’re asleep, your heart rate and blood pressure go down. That gives your heart a much needed break. Avoid smoking and limit alcohol intake. New WIC client video now available! ITCA is pleased to announce that videos are now available in English and Spanish to help new WIC clients learn about WIC and how to use WIC benefits! Check out the videos here!